Los Angeles periodontists Dr. Aalam and Dr. Krivitsky offer the highest quality cosmetic periodontal treatments and procedures to improve patients’ oral health as well as their overall appearance. Cosmetic periodontal services at the CENTER for Advanced Periodontal & Implant Therapy are a popular and proven way to acquire a new and beautiful smile. Many patients, when they initially come to our expert periodontal specialists for periodontal services in Brentwood, are unaware of the cosmetic improvements that our services provide. Gaps formed by missing teeth can cause periodontal disease and infections that may affect a person’s ability to eat or speak. It is very important to fill in any gaps to prevent the adjacent and opposing set of teeth from shifting positions or causing further damage to the mouth. Gaps are also not very attractive, and therefore artificial teeth act as a restorative and cosmetic dental procedure. With today’s advancements in dentistry in Los Angeles, your tooth implant will look and feel extremely natural, and most patients forget the tooth was replaced. Check out our dental implant before-and-after gallery. 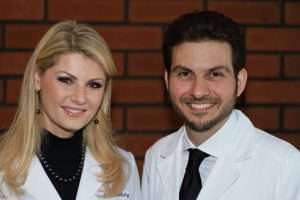 Beverly Hills periodontists Dr. Alexandre Aalam and Dr. Alina Krivitsky are dedicated to helping their patients feel confident and comfortable, not only when they smile but also as they go about their daily lives. In addition to their many aesthetic advantages, dental implants offer a number of benefits for your oral health. Artificial teeth allow for the replacement of one or more teeth without affecting the bordering teeth. Additionally, implants can support a bridge and eliminate the need for removable partial dentures. Because dental implants are easier to brush and keep clean than dentures or bridges, they may reduce your risk of developing gum disease in the future. Finally, these can help preserve the integrity of your mouth and face by supporting gum and jawbone structure. At the CENTER, Dr. Aalam and Dr. Krivitsky thoroughly evaluate each patient to determine the best dental implant procedure. When you schedule a consultation at our Brentwood-area office, we can help determine the best treatment for you. Single implants are a great way to bring your smile back to life in Beverly Hills. If you are missing a single tooth, an implant and a crown can be used to restore your beautiful smile. With a dental implant, both the lost natural tooth and its root are replaced. A dental implant looks and functions exactly like a natural tooth without sacrificing the health of the neighboring teeth (for example, a tooth-supported bridge will require the grinding of two neighboring teeth to fit three crowns splinted together). Heavy grinding might require the need of root canals on the abutment teeth, and teeth splinting makes it difficult to for patients in Los Angeles to floss and clean, heightening the chances of gum disease or decay. With a dental implant, the bone is better preserved because the root is replaced. A patient’s flossing capability is maintained since the missing tooth is replaced with a single implant/crown. More importantly, Dr. Aalam and Dr. Krivitsky in Beverly Hills will not harm the neighboring teeth by grinding them down and attaching crowns to them. The true value of a single tooth implant is the preservation of the natural dentition. If you’re missing several teeth, implant-supported bridges can replace them and restore your confidence. When placing multiple dental implants, Dr. Aalam and Dr. Krivitsky in Los Angeles will replace a patient’s lost teeth and the roots, giving patients an aesthetically pleasing, natural-looking smile. Dental implants have several advantages over other teeth replacement options such as removable partial dentures. Not only do multiple implants look natural and function like real teeth, but they are permanent, meaning that the prosthesis never comes out of your mouth. You eat, sleep and function the same way as if you have your own natural teeth. In addition, because implant-supported bridges will replace some of your tooth roots, your bone is better preserved, offering better long-term results in Beverly Hills. Dental implants integrate with your jawbone, which keeps the bone healthy and provides results that are beautiful, functional, and comfortable. For patients who are missing all of their teeth, multiple implants can be used for full dental restoration. Because implants are secured into the jaw, fully edentulous patients experience greater security than with artificial teeth or dentures. Good candidates for multiple implants have a healthy set of gums and enough bone to support multiple implants. Dental implants offer countless benefits for patients who are missing teeth or require dentures. They will increase your willingness to show off your smile. Patients quickly notice after receiving artificial teeth how beautiful their smiles are and how attractive their gums now appear. Dr. Aalam and Dr. Krivitsky specialize in creating natural-looking dental implants in Los Angeles that match the look and feel of your actual teeth. Many patients can not even tell the difference between their implants and original teeth. Additionally, implants improve oral comfort and speech in a way that traditional dentures do not. As a result, you will likely feel increased self-confidence when smiling or speaking at work or social occasions. Dental implants are fused to the bone and offer more stability than traditional bridges and dentures. During the procedure, the implant will be inserted into the jaw to replace the tooth root. While the implant heals, your periodontist will place a temporary crown until your beautiful, brand-new custom implant is ready for permanent placement. Many patients sense greater security with artificial teeth than other procedures because they are secured into the jaw. In order to qualify for this procedure, you must have a set of healthy gums and enough bone to support the dental implant. Q: Will my teeth implants match my existing natural teeth? A: Yes! Your teeth feature a custom-designed porcelain crown that exactly matches the shade of your existing teeth. Patients often have difficulty distinguishing their natural teeth from their beautiful new teeth implants. Q: Are there any age limitations? A: No, there is no age limit for artificial teeth. Any person over the age of 18 can have dental implants as long as there is enough bone available in which to place the implant. Q: How often will I need to have checkups? A: The success of your implants will depend greatly on how well you maintain them. They need to be professionally cleaned and examined once every three to six months. Also, brushing and flossing daily is absolutely necessary for long-term maintenance of your teeth, as well as maintaining overall systemic health. We offer periodic educational seminars on how to maintain healthy gums and increase total oral health. Q: Is the dental implant procedure painful? A: No, it is not. We are dental implant experts. We pride ourselves on pain-free and gentle treatment. An effective local anesthetic is used during the procedure so that you do not have any discomfort during the placement of the dental implants. We also use an IV sedation method that is designed to help the patient relax and feel completely comfortable. This sedation works quickly and completely relaxes the patient and eliminates any stress or anxieties. Although this method does not induce sleep, the patient will feel completely relaxed and the periodontist will be able to accomplish a higher level of dentistry in a shorter amount of time. The mild discomfort you might experience after dental implant surgery can be controlled with medications. Q: When can I return to work after tooth implant surgery? A: You can return to work after a dental implant procedure in Beverly Hills the following day unless a particular surgical circumstance arises. Dr. Aalam or Dr. Krivitsky will discuss all post-operative care with you.